Along with a move from King’s Cross to the Southbank, this year’s designjunction attracted a new headline sponsor - Rado. The Swiss watch brand sees design as a key element of its DNA, regularly collaborating with leading designers on the creation of new timepieces and also running design competitions around the world for young designers who are just starting out at the beginning of their careers. They are a company I’ve been proud to work with over the past couple of months, because as well as placing design at the forefront of what they do they also share a commitment to one of my other passions, tennis - Rado are the official timekeepers at 15 tournaments around the world - but it’s their support of emerging designers through the Rado Star Prize that I want to focus on here. The Rado Star Prize is an established design competition that is held around the world in various international editions. The inaugural UK edition was held last year with the judges’s prize awarded to Joachim Froment for his 0.6 Chair. This year it returned for its second edition with a theme of ‘On Time / Time Off’. Entrants were invited to explore the concept of passing time, enriching life, and products that enhance the user’s awareness of where they spend their time. Shortlisted projects included lighting, ceramics, furniture and innovative manufacturing processes and the ten finalists were invited to exhibit their designs at designjunction during London Design Festival with the winner receiving a £5000 cash prize as well as a Rado timepiece. The judges awarded the 2018 prize to David Knowles, a 3D design student from Northumbria University, for his GC18 coffee table. Made of hexagonal columns cast in Jesmonite it was inspired by the natural beauty, grandeur and structure of the Giant’s Causeway. 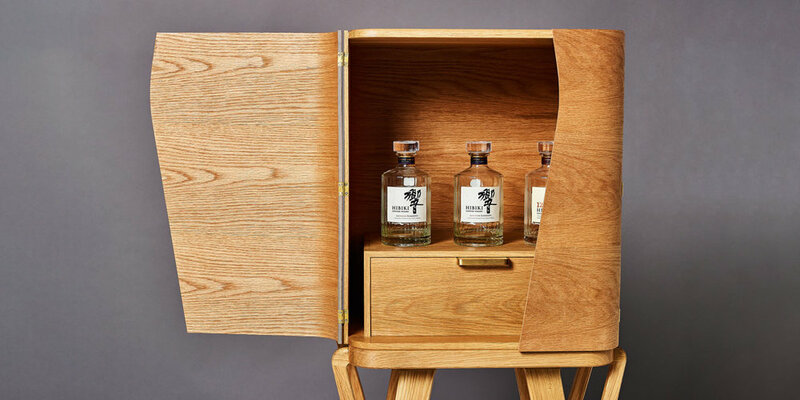 Other shortlisted entries included this Japanese inspired whisky cabinet by Scott Ridgway. Designed to complement a whisky lover’s ‘Time Off’ it draws influence from the traditional Japanese craft of Magewappe, in which straight Cedar is bent into lunchboxes and steamers. Georgina Heighton’s playful oak lamp has horizontal oak dowels that can be rolled, slid and rearranged so that as well as diffusing the light they also encourage the user to interact with the product. I particularly liked Heleen Sintobin’s Tartufo Collection - a stool and bench created by reviving an ancient natural chemical colouring technique to celebrate the intrinsic qualities of vegetable tanned leather. The leather folds are cleverly held in place by wooden dowels, so there’s no stitching involved. In addition to the judges’s prize a second prize was awarded by public vote. Visitors to the show were invited to nominate their favourite project from the shortlisted designs for the Public Vote Prize. This was awarded to Martina Taranto for The Limescale Project. Her entry sought to convert the problem of limescale into an opportunity by developing a process in which limescale acquires the shape of underground pipelines, meaning products can be grown and harvested naturally. Also on show at designjunction was the latest timepiece in Rado’s series of designer collaborations, and it’s first with a leading female designer, the True Thinline Studs by Bethan Gray. The brass studs and marquetry pattern on the dial bring a new interpretation to Rado’s slimmest timepiece, and echo details that can be found in Bethan’s furniture collections. I’ll be taking a closer look at this beautiful limited edition design over on Instagram later this month.